Brief Description: An incredibly popular neighbourhood diner, on East Hastings, just past Commercial Drive. 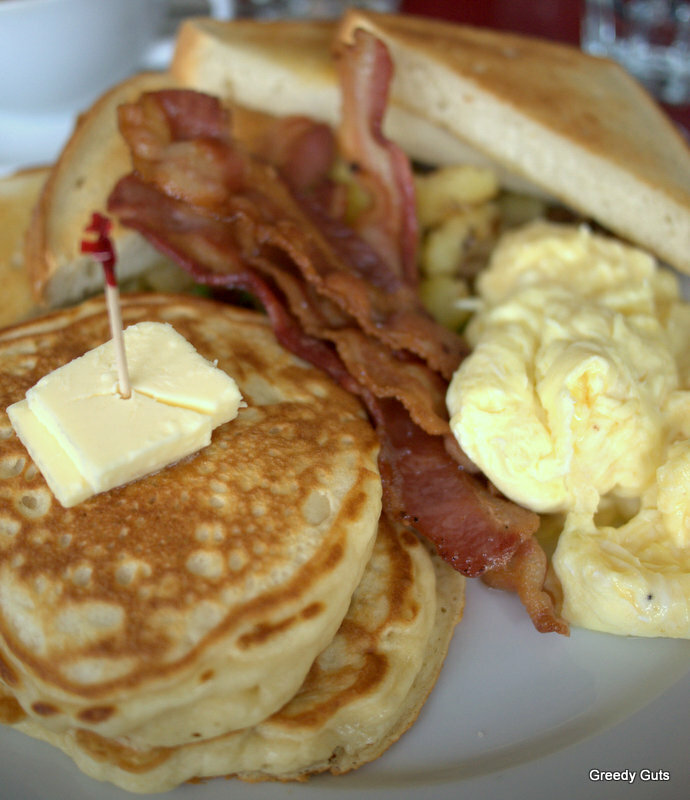 They serve large portions of hearty breakfast to the hungry crowds that line-up outside. Last weekend I FINALLY got into The Red Wagon Cafe. This is quite the feat, you must understand. I’ve been twice before, almost committed to the possible hour-long wait, and then decided against it. Therefore, on Sunday, when we discovered that the queue was just in the doorway, B and I jumped in the line immediately. It only took us 15 minutes or so – not bad for Sunday brunch at one of the most popular places in town. It comes as no surprise that this place is busy. Not only is it one of few diners in an area with not much competition, but it is small inside with only about 10 to 12 tables and bench seating. Oh, and don’t forget that the popular Food Network show “Diners, Drive-ins and Dives” made a visit to Red Wagon last year. All of these factors combined make it very difficult to get into Red Wagon. So why the fuss? Well, it appears to me that Red Wagon takes something pretty simple – hearty diner brunch – and executes it better than most places. Keep in mind that I’ve only been there once (not my usual three visits) but I was surprised at the quality of the food. Yes, it was the usual suspects of bacon, eggs, and pancakes, but the bacon was cooked well, the scrambled eggs were decent (albeit slightly under-seasoned), and the pancakes were delicious. I love pancakes but it can be hard to find decent pancakes that aren’t doughy and tasteless – Red Wagon’s were surprisingly tasty. So not only is the food tasty and the portion sizes are very generous, but the prices are affordable. The most expensive thing on the menu costs $14.50. I ambitiously ordered the Trucker Breakfast which was so large that it proved to be an undertaking. B ordered the house-speciality of Pulled Pork Pancakes (he dove into them so fast that I couldn’t get a photo). He really liked the pulled pork nestled between the layers of pancakes and finished with Jack Daniels maple syrup but it was too heavy for me. However, I am probably one of the only people in Vancouver not overly impressed with this dish. Overall, I did enjoy The Red Wagon but I don’t think I would rush back. Why not? I hear you ask. If the food is good and the price is right, why not? For me it comes down to the location and the line-up. Red Wagon is basically on the opposite side of the city to where I live so already that works against it. And I hate lining up for brunch. An hour spent in a line-up, before I have had coffee or food, is a big investment to me and it is one I’m not willing to make regularly. So, let me finish by saying, that if you live close to The Red Wagon or if you are willing to wait for your breakfast, for sure, it is worth the hype.